Pinnacle was founded in 1998 and in a short space of time has grown to be one of the worlds leading International sportsbooks, fully licensed and regulated, with thousands of satisfied customers from over 100 countries. Pinnacle is one of the Internet's largest sports betting site with an industry-leading reputation for providing consistent value to the player with odds that are up to 60% better value than other bookmakers. 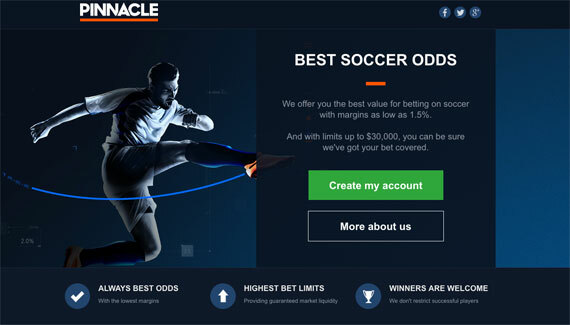 With low minimum bet requirements and the highest maximum limits on the Web, Pinnacle gives punters the assurance of fixed odds betting with exchange like pricing but unlike an exchange, Pinnacle has guaranteed liquidity and never charges commission on winning bets. Pinnacle is where the pros play, the business was founded by experts for experts, giving the best value, super fast payouts, all on a safe secure site. Supported Languages: English, Spanish, German, Italian, French, Polish, Russian, Swedish, Norwegian, Finnish, Portuguese, Hebrew, Czech, Japanese, Korean, Traditional and Simplified Chinese. Sports: Basketball, baseball, american football, hockey, soccer, tennis, golf, horse racing, motor racing, boxing, and more. Soccer Leagues: England, Scotland, Italy, Holland, Germany, Poland, France, Spain, Austria, Greece, Turkey, Czech Republic, Sweden, Denmark, Norway, Finland... Italy, Spain and UK down to the regional level, most Eastern European countries, the major national cups and International tournaments. Maximum Bet: The maximum limit per bet may vary depending on the particular sport, type of bet offered and the time relative to the start of the event. In general, the limits will typically increase closer to the start of the event with the highest maximum limits available on the day of the event. Maximum Winning: Limits apply to soccer accumulator wins & maximum horse payouts. Deposit Options: Bank Wire, Cashiers Check (USD and CAD only), Instant E-Checks (USD and CAD only), Credit and Debit Card, Neteller and NETeller InstaCASH, INSTADEBIT (For USD only), WebMoney (For USD and EURO only), Skrill (Moneybookers), Visa Electron Debit Card (For GBP only). Minimum Initial Deposit: $50 or equivalent in other currencies. Withdrawal Options: Checks via Federal Express, Bank Transfer, Neteller, Skrill (Moneybookers), INSTADEBIT, WebMoney. Each Pinnacle client receives one free withdrawal per calendar month, using any of the authorized withdrawal methods. Other options and informations: Opportunity to play casino; Secured website technology (SSL).